In years past, this blog has been a great source of information regarding the exhibitors, attractions, and features of the Philadelphia Flower Show. With the launch of our new website, we’ve streamlined our blogs into one spot! When you’re looking for some in-depth coverage of the Show, please find it here at the PHS blog. Good news! We’re having a Cyber Monday sale. 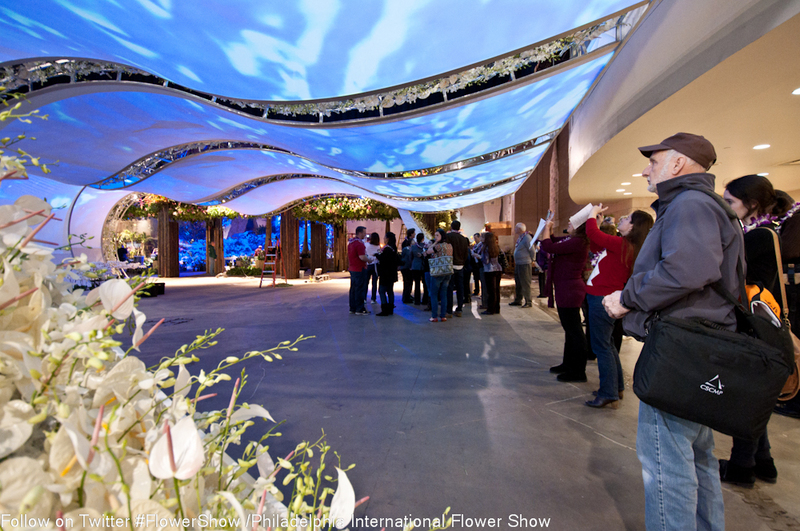 Enter promo code BRILLIANT when purchasing Flower Show tickets at theflowershow.com and you’ll receive $2 off adult, student and child general admission tickets. You can also save $5 on a Flower Show Value Pak, which includes four general admission tickets and a FREE one-year PHS Membership. Offer valid Monday, November 26 from 12:00 am – 11:59 pm EST. 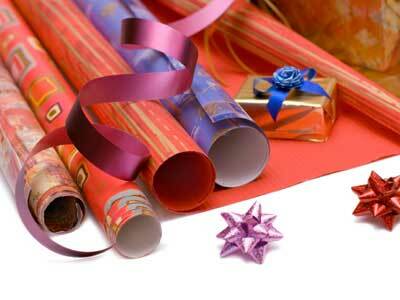 Remember, tickets make great gifts! 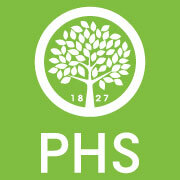 It’s time to start planning your visit to the 2013 PHS Philadelphia Flower Show! 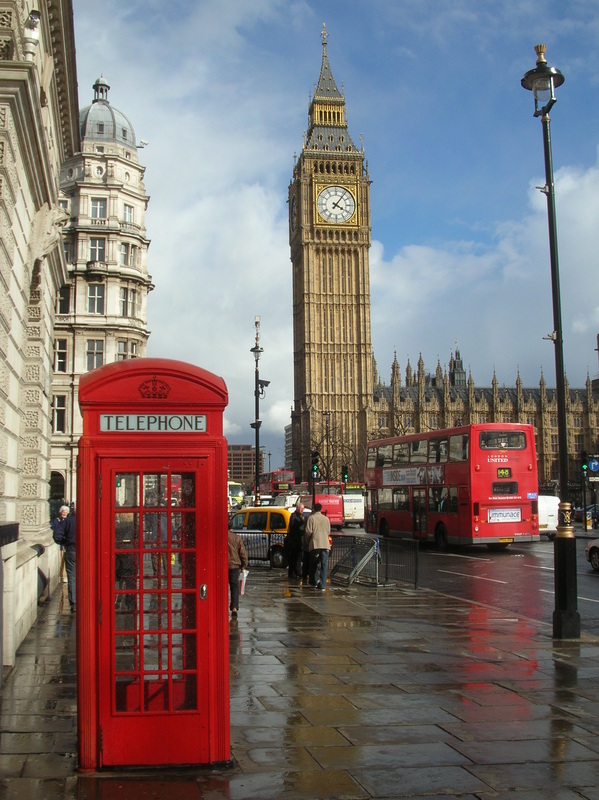 New in 2013, the Flower Show will be open for an extra day—from March 2 to 10—giving you two full weekends to experience the culture and horticulture of the United Kingdom while exploring great gardens and learning from the world’s most celebrated growers and designers at the Pennsylvania Convention Center. All proceeds from the Show, from both ticket sales and sponsorship contributions, support PHS and its acclaimed urban greening programs, including City Harvest. Click here to purchase tickets and while you’re on there, check out the special PHS membership benefits, theme nights, garden teas, ticket packages, sneak peak construction tours, and more. We can’t wait to see you there. Cheers! What is a PHeaSt? On October 19, 2012, from 7 to 10 pm, PHS will transform its warehouse and grounds at the Philadelphia Navy Yard into a rustic party venue for PHeaSt, a one-of-a-kind celebration of fantastic farm-to-table dishes. PHeaSt will feature inspired culinary collaborations between the region’s finest chefs and local growers in support of the PHS City Harvest program, which grows fresh organic produce to feed more than 1,000 families in need every week. The centerpiece of the event will be a mammoth handmade table, which will underscore PHS efforts to “bring everyone to the table” for celebration and collaboration. Guests will be treated to a corral of tasting tables where they can also visit with local celebrity chefs, farmers, and growers who will create seasonal masterpieces using local bounty. Guests will be invited to participate in the People’s Choice Award with chance to win a gift card to the restaurant garnering the most votes. The evening will also offer entertainment, outdoor fire pits, and twilight views of the Navy Yard. Tickets are $150; VIP tickets are $300. To purchase tickets, please click here. To whet your appetite for PHeaSt, below are a few of the chefs who will be in attendance. Full profiles can be found on our Pinterest board here. Situated on the second floor in the historic Provident Bank Building just off fashionable Rittenhouse Row, Davio’s Northern Italian Steakhouse wins accolade after accolade, year after year. Executive Chef David Boyle is paired with Growing Home Gardens (a project of the Nationalities Service Center) growers Adam Forbes, Dilu Kaflay, Lun, and Htee Da Win t.
Katie is a registered dietitian and personal chef with Healthy Bites, a catering, meal delivery, and nutritional services company in Philadelphia. She was awarded Philadelphia Magazine’s“Best of Philly” Nutritionist for 2012 and is the consulting dietitian for the Philadelphia Phillies. At PHeaSt, Katie will be paired with Earthskeepers growers Alia Walker and youth. Esquire magazine hailed Lacroix the “Best New Restaurant in the United States” upon its premiere in 2003. Executive Restaurant Chef Jon Cichon, incorporates his experience with international cuisine by combining Spanish, Portuguese, Thai, Japanese, and American flavors to create his own infusion. Chef Jon will be paired with Farm 51 growers Andrew Olson and Neil Santos. The three Marathon restaurants share the goal of providing the highest quality fresh food at an excellent value, while striving to create relationships and build strong partnerships through their metal-smiths to the mural artists they work with to the farmers they buy from, and urban farms they hope to build. Chef Justin Robertson will be paired with Marathon Farm grower Eddy Branch. Portfolio.com dubbed it “The Toughest Table in America,” and The New York Times praised the “handsome, deceptively complex and masterfully executed” food, likening the experience to a “spiritual retreat.” The Talula’s Garden experience also earned a spot on the 2010 “Saveur 100” list. Chef/Owner Aimee Olexy and Executive Chef Sean McPaul will be working with Monsieur Tom Culton of Tom Culton Biologique. See more chefs and growers on our Pinterest page! As headquarters of the Constitution’s landmark 225th anniversary, the National Constitution Center had a lineup of celebratory events in September that included a floral art pop up by Bill Schaffer (AAF, AIFD, PFCI) and Kristine Kratt (AIFD, PFCI) of Schaffer Designs, three-time “Best in Show” winners at the Philadelphia International Flower Show. 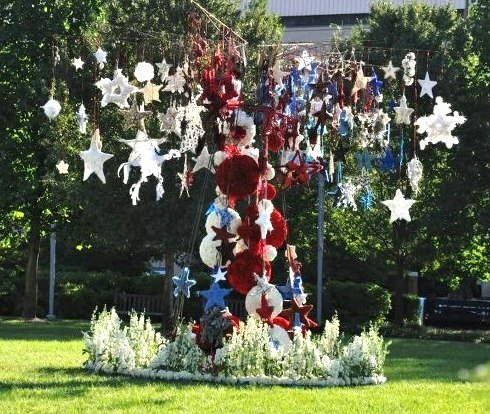 This sculptural piece was assembled on the Center’s front lawn on September 17 and incorporated 80 stars submitted by top floral designers from 46 states, Puerto Rico, and the United Kingdom. 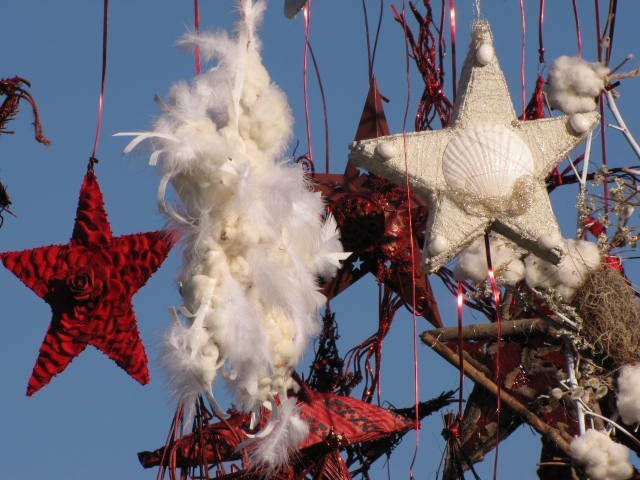 The stars, which many of the designers made using materials indigenous to their respective states, were hung along with large, monochromatic spheres that had been covered with red or white carnations, white larkspur, stock, and hydrangeas. Christian Kanienberg, a sculptor and mural artist from Wilmington, built the 12- by 16-foot steel canopy to display the bouquet and Delaware Valley Wholesale Florist donated the flowers. Bill, Kristine, and their crew of volunteers began their creation at 5:30 am and because of National Park Service rules, had to dismantle it by sundown the same day! Join us in not only celebrating the anniversary of the Constitution, but also in congratulating Bill and Kristine on their success, their vision, and for their dedication to such a special project! The next few days are a flurry of activity for PHS, so we thought we’d break it down for you. If you are somehow able to attend all these events and activities, you will most certainly earn our admiration and appreciation. Join PHS for a festive evening in the PHS Pop Up Garden. Celebrate autumn in the garden with samples of Subarashii Kudamono Asian pear wine, made from Pennsylvania-grown gourmet Asian pears, paired with slices of fresh Asian pears, as well as a selection of local, artisan cheeses and breads, courtesy of Fair Foods. Also, you can purchase PHS hats and t-shirts, artful seed packs, pots and plants, and more at the PHS Pop Up Shop during this event. Pear Pairing is a free event, open to guests 21 and older. Space is limited, and pre-registration is required. More information. Learn about the PHS Roots to Re-Entry jobs training program as part of the Urban Sustainability Forum. This panel discussion among partners and stakeholders will discuss the strategies for (and importance of) getting once-incarcerated individuals empowered for employment. The evening discussion takes place at the Academy of Natural Sciences. More information. Join us back in the Pop Up Garden for a presentation by celebrity chef Hope Cohen, presented by Firstrust, an official sponsor of the garden. Little Baby’s Ice Cream will be on site selling its delicious, locally made treats. More information. Also, across from the garden, PHS will participate in the international Park(ing) Day by setting up a one-day mini-park in a metered parking space on Walnut Street. Learn more about Park(ing) Day here. Start the fall season with a fantastic celebration! The 2012 PHS Fall Garden Festival takes place on the first day of autumn at the Navy Yard, an exciting location with a mix of historic structures and riverfront views. The festival is all about family, and we’ll have great activities for kids, shopping for adults, a preview of the 2013 Flower Show, and much more. The PHS Young Friends will bring back their popular Biergarten featuring Victory brews. Click here for details. The Fall Garden Festival will also include two friendly competitions: “Garden Bounty” and “Garden Giants.” For entry information, click here. Carla Hall and Daphne Oz of ABC’s “The Chew” will be there with live demonstrations, Q&As, giveaways and more! Catch The Chew weekdays at 1 pm on 6abc. The Fall Garden Festival is free and open to everyone (although there are definite perks to being a PHS member). See you there! Our Gift to You: Join Us in the Pop Up for a Pear Pairing! As a thank you to our loyal blog readers, PHS invites you to the Pop Up Garden to enjoy samples of local cheeses and breads from Fair Food, herbs from the garden itself, and samples of fresh Asian pears and Asian pear wine—all during a bucolic event on Wednesday, September 19 from 5 to 7 pm at 1905-15 Walnut Street, Philadelphia. Fair Food has been uniting local farmers with businesses and consumers for more than ten years. They promote the importance of family farms and create a year-round marketplace for fresh, local, and humane food products in the Greater Philadelphia region. The Asian pear wine comes courtesy of Suarashii Kudamono, which is based in the Lehigh Valley and means “wonderful fruit” in Japanese. Pear Pairing in the PHS Pop Up Garden is a free event for our social media fans who are 21 and older. Registration is required at https://www.pennhort.net/pearpairing. Sign up soon because space is limited! And for a great recipe using Asian pears, visit our Pinterest recipe board. 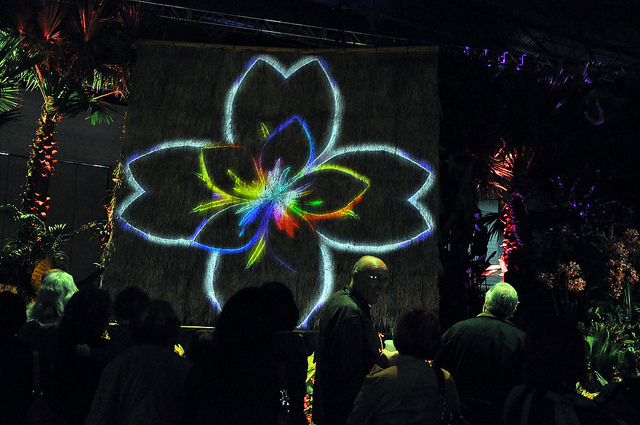 Feeling a bit nostalgic for some of the amazing sights from the 2012 Flower Show? Klip Collective has posted a video on its website that features some of the visual technology that was used at the show. 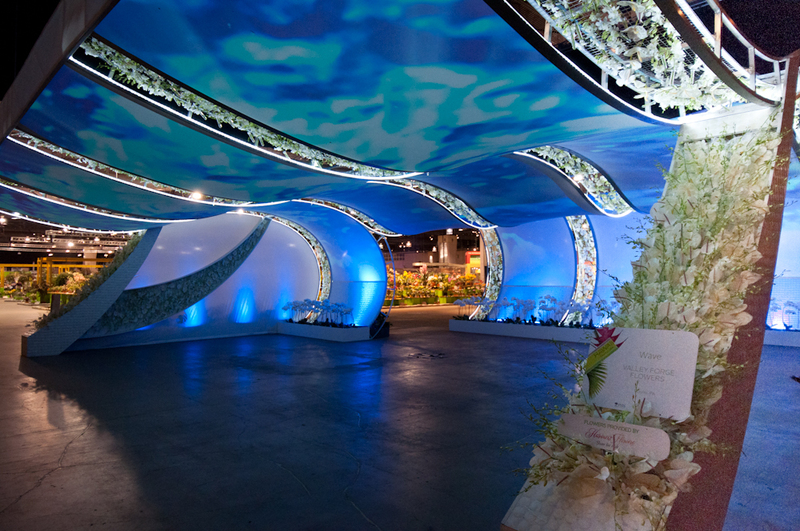 Working with GMR Design, Klip Collective created projection spectacles including the large “wave-wall” at the entrance of the show that invited visitors to walk under a calming display of sea creatures and flower blossoms. A central Hawaiian temple featured video-mapped animations and filmed content to tell the story of Pele, Hawaii’s female fire god, and to transform the temple exhibit into a vibrant light experience. While at Klip’s website, check out some of the other amazing projects! Join PHS for happy hour in the Pop Up Garden (on Walnut Street between 19th and 20th) on Thursday, September 13 from 5 to 8 pm. Sip wine or beer and indulge in some light fare compliments of our Pop Up Garden sponsor, Chipotle Mexican Grill. Tickets are $40 until August 30 and $50 thereafter, with all proceeds going to PHS’s City Harvest program. City Harvest grows fresh produce through a network of community gardens and helps feed more than 1,000 families in need each week. Not only does the Pop Up Garden raise awareness for City Harvest, it has also been profiled for its role creating healthy community spaces, inspiring successful philanthropic efforts, and offering a quiet respite from city life. 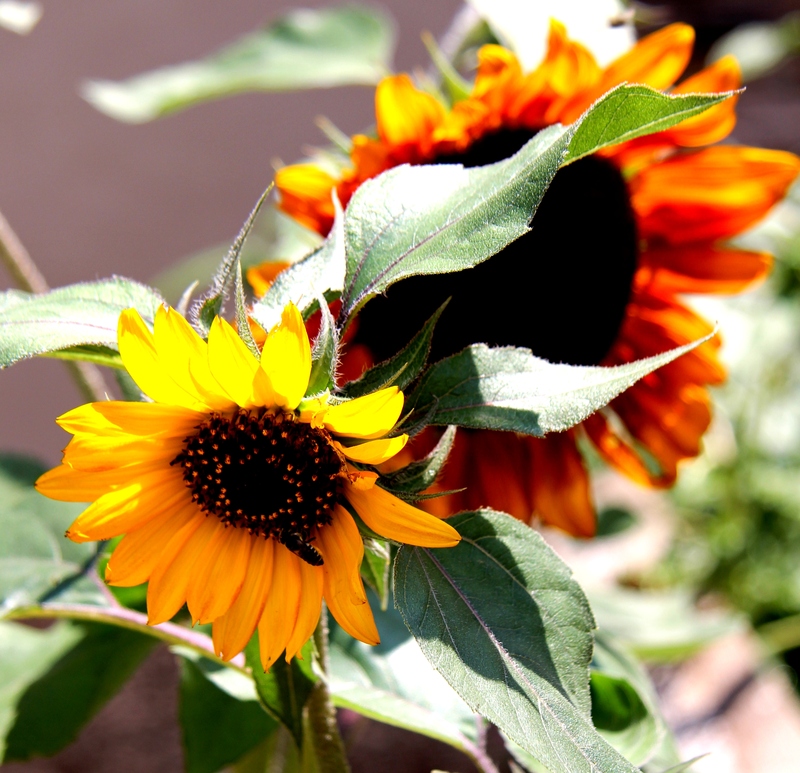 On Generocity.org, the role of the Pop Up Garden as a philanthropic effort with multiple, coordinated sponsors was profiled. PHS President Drew Becher was quoted as saying, “Philanthropic efforts of companies look for three things. You have to offer employee engagement, volunteer opportunities, and employee education. The Pop Up fulfills those requirements for at least three months, providing lectures on a variety of topics, as well a need for volunteers to staff the garden,” he added. The concept of the Pop Up Garden is important because studies show reclaimed lots lead to healthy communities. In an article on Newsworks.org, Lari Robling posted that, “Health researchers have long suspected that ‘cleaning and greening’ overgrown, vacant lots does a neighborhood good, now they have gathered mounting—and solid evidence—that transforming nuisance properties pays off in health dividends.” this article profiled how PHS’s efforts in greening vacant lots is an ongoing effort at more than 8,000 properties. Space is limited at the happy hour—make your reservations now at www.pennhort.net/happyhour.